Organizations are collections of users, both end-users and agents (see About groups and organizations). Multiple organizations for users is available on Professional or Enterprise. Organizations are not available on Essential, and users can belong to only one organization on Team. An administrator must enable multiple organizations for users before you can add users to multiple organizations (see Enabling multiple organizations for user). You can add a user to multiple organizations, up to as many as 300. You can remove a user from any of their organizations as needed. Any non-closed tickets associated with that user and that organization are updated to have no organization. They aren't automatically assigned to another organization. You can add an organization to the associated tickets at any time. Any closed tickets remain associated with the organization that was set on the ticket when it was closed. Note: Administrators can add users to multiple organizations through bulk user import (see Importing users into multiple organizations). If one of the organizations a user belongs to is deleted, any non-closed tickets associated with the deleted organization are updated to have no organization. If the organization that was deleted was the user's default organization, one of the user's other organizations is promoted to be the default organization. Open the profile for the user you want to add to multiple organizations. Start typing the name of the organization, then select the organization. A list of matching organizations appears as you type. Click Add organization to add another organization, and repeat as needed. Click the name of the organization you want to remove, then select Remove. Click Yes, remove it in the confirmation box. When you add a user to multiple organizations, the first organization that you added to the user becomes the user's default organization. If the default organization for a user is deleted, and the user belongs to multiple organizations, one of the other organizations the user belongs will become the default organization. When an organization is deleted, any non-closed tickets associated with the deleted organization are updated to have no organization. If the organization that was deleted was the requester's default organization, one of the requester's other organizations is promoted to be the default organization. The default organization is also used in Insights for reporting. You can report on users according to their default organization only. You can change the default organization for a user at any time. In the user's profile, click the name of the organization you want to make the default, then select Make default. When users belong to multiple organizations, they can choose the organization for any support request they submit in your Help Center. Users who belong to multiple organizations can change the organization for any of their support requests in your Help Center. User 1 is a user in each of these orgs. I assume in this scenario, we'll need to enforce customers to submit a ticket online so they can select the appropriate org. Each org has a unique tag associated with the support level (i.e. "vip"). If User 1 selects Org C from the drop down, will the "vip" tag be added to the ticket? Or is there another way of managing entitlements? This reply is a little late, but I wanted to let you know that you are correct here. You will want users to submit a ticket from your Help Center, this way they can select the appropriate org if they are members of multiple orgs. Since the user's tags and their org tags will be added to tickets they request, if you have a tag called "vip" on Org C and a user submits a ticket with that Org C selected the tag will be added to the ticket. Hi, we have the need to connect an end user to more than 300 organizations. We have some users that have up to 5,000 organizations (large restaurant chain). Is Zendesk working on enhancing this to accomodate the B to B model that we operate in? Is there any way to identify the end-users belonging to multiple organizations? I have tried the user export (XML) - it only lists the user record for the default organization. Thanks for your question! If you or someone on your team is familiar with utilizing the API, you could create a script using this "Organization Membership" API doc. Per that article, a membership links a user to an organization. Organizations can have many users. Users can be in many organizations if the account supports multiple organizations. This end point will allow you to to list users in an organization. We also need more than 300 organizations... Is this being worked on? As far as I know this isn't something on our to-do list...I did some poking around in our Product Feedback forum, and I don't see any threads on this particular thing either. I'd definitely recommend popping over there to post your suggestion, including your detailed use case - that information is really helpful to our Product Managers so they can fully understand the problem you're trying to solve. How does this work with the https://developer.zendesk.com/rest_api/docs/core/tickets#create-ticket API? As an administrator, how do I create a ticket on behalf of an end-user who is part of multiple organizations? How do I choose under which organization the ticket will belong to? I'm on the Professional plan but don't have the option to add a second organisation as there is no 'Add Organization' option. My guess is that an admin hasn't actually enable this feature yet - it's not turned on by default. You can find instructions on how to enable it here. 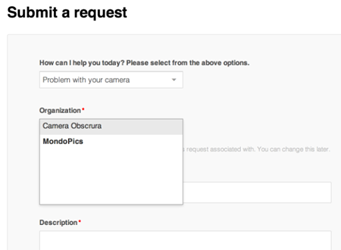 "When users belong to multiple organizations, they can choose the organization for any support request they submit in your Help Center." Is there any way to have end users in multiple organizations but skip the form field where they have to select one? Or have the default org's value submitted? In other words, as an end user I don't want to see that field. EDIT: I can manage it with CSS, but I'd like to know if there is a native way to configure this field's requirement and visibility before the end user. Thanks for posting this question. Unfortunately, at the moment this can only be done with a bit of CSS in your Help Center code in Guide. There's not currently a setting to just switch that field off within the product. This would be neat functionality though so I definitely recommend posting this as a feature request over in our Product Feedback forum. Ok so I have a question as to the functionality here. "When you remove a user from an organization, any tickets that are less than closed, and are associated with that user and that organization, will be assigned to the user's default organization. Any closed tickets remain associated with the organization that was set on the ticket when it was closed." It sounds like you are saying that if a user is removed from Organization A that any tickets that were associated to that user and Organization A will be changed to the user's default organization which is different from Organization A. Is that the case? If so then that makes no sense to me at all. Why would you change the organization that a ticket is associated too? Tickets should be linked to the organization and not the user. Thanks for checking in with us on this. Tickets are associated to users on the user level, and not on the organization level like you're looking for here. In light of this, the behaviour noted here is expected. If you remove a user from an organization, and that user only has this 1 organization linked to their profile as their default (only) linked org, then the users active tickets will remain assigned to the user and not associated with any organization. If you remove a user from an organization, and that user is linked to multiple organizationns on their profile; when you remove the user, all of their active tickets will be reassigned to the organization which has been set as the default for the user. I know this may not be ideal for what you're looking for here; however I hope this has been of help in clearing this up for you regarding the behaviour around removing a user from an org and what happens to their active tickets. How could one configure a report that shows the user and all organizations that they belong to? The two "How"s of my report are "User" and "Organization Name" but the results of this report only show one organization associated to a user that has been configured with 2+ Organizations. Unfortunately it's not possible to list users under each of their Organizations. The Gooddata Data Model only allows users to have one Organization association value in a Report, and that's their default Organization. If you want to list all organizations a user is a part of you'll most likely need to use the API to accomplish this.